Technology like smart phones, tablets, Apps, and 3G/4G broadband allow anytime anywhere mobile learning and these technology are lubricating the shift to more inclusive and higher quality personalized education. But a truly immersive mobile learning experience goes beyond all the technology to the lives of each individual learner. Varying features of devices. From design point of view, it is difficult to push interactive-rich content onto every possible device. Although it is possible to distribute specific mobile device to learners for certain projects (ex. 1:1 iPad program in some schools), many education institutes choose to adapt BYOD (Bring your own device) approach for various reasons. Slow and limited Internet access. Although in North America and Europe, free public WiFi and 3G/4G is widely available, download speeds on mobile devices continue to present problems in some situations. And in many developing countries, high-speed broadband access is still expensive and/or completely unavailable. Limited memory. All devices have limited internal storage capacity or memory. Extra random access memory (RAM) to store files can be added to devices by use of memory sticks or cards but it doesn’t work for all the devices. Cloud storage enables access the data sources everywhere, but requires Internet connection. Awkward data input. Inputting the information in terms of text data into the mobile devices is always time-consuming. Wireless keyboard can be used to improve the input capabilities. Based on our intensive experience in m-learning, a set of principles have been developed to ensure successful delivery of mobile learning projects to the widest range of audience. Mobile learning course need to be able to meet the requirements of a wide range of learners with different preferences, abilities, schedules and levels of connectivity. 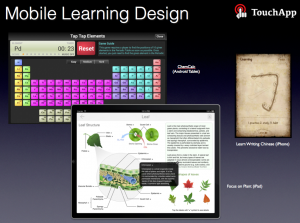 Learners should be offered choice to jump between learning modules through navigation design. Package content in small chunks (bite size learning) have pedagogical advantages for all learners to adjust learning according to their own situations. Big data and real-time learning data analysis enables personalization in education. Mobile learning design need to consider integrating function models to collect and analyse learners’ performance data and feedback to learners and educators. With real-time access to personal and individual feedback, learners can plan “just in time, just enough, just for me” tailored learning. Unnecessary complexity should be eliminated and course design should render clear and accurate. Poorly organized resource and irrelevant overload content will daunt learners and fail the whole project. Learners’ interfaces and navigation design should direct learners to follow underlying learning paths. The subject delivered should be authenticated by experts in the field and eliminate possible controversies. Meaningful and effective mobile learning need to be able to grab and maintain the learners attention at personal level. Technique options (video, animation, audio) and teaching methods (storytelling, scenarios, gamification) should be carefully used to engage learners, stimulate their interests, retain their attention, and maintain a positive attitude in a nurturing environment. To minimize hazards and adverse consequences of user errors, mobile learning courses should be designed with certain tolerance for errors. Help menu and descriptive warnings of errors can guide learners to positively interact with the m-learning content. Inputting text data into mobile devices should be minimized and other mobile friendly interactive methods (touch gestures) can be used to increase the efficiency and excitement. Magnifier and audio assistance can be attached to increase the content accessibility. M-learning instructors can provide support for learners in various forms. Course related requests, reminders, quizzes, and questions can be sent to students in the form of SMS messages or emails. Effective system to encourage discussion and student feedback should be established from the beginning. Technique support for both instructors and learners should be easily accessible. You should always think your mobile learning course as an on-going project and be prepared to change and adjust. With the contributions from both educators and learners, your m-learning adventure will evolve and flourish together with the development of technology and pedagogy.